I love Antiques Week. Every year, during the third week in January, collectors, curators, and dealers—indeed anyone with a passion for antiques—gather in New York for the Mardi Gras of Americana. The Winter Antiques Show attracts the rich, the famous, and even some of us in the other 99 percent. Major sales at Sotheby’s and Christie’s create flutters of excitement. This year, Sotheby’s offered the collection of Anita and Irvin Schorsch. It was a sale for the ages. Collecting voraciously since the 1960s, the Schorsches filled their Colonial Revival farmhouse near Philadelphia with every possible household treasure. Needlework, carpets, ceramics, silver, prints, paintings, and a bevy of 18th-century Pennsylvania furniture (with a sprinkling of New England pieces to boot)—it was all there, and the quantity was overwhelming. The catalogue for the sale ran 608 pages and listed 1,049 lots. The auction lasted three days. Unlike most major sales, every lot was sold unreserved; in other words, there were no thresholds that bids had to exceed. Prices ranged from $970,000 for a massive Massachusetts chest-on-chest to $63 for a 19th-century lead tobacco box. Every lot sold. Over at Christie’s, well-preserved rarities held sway. 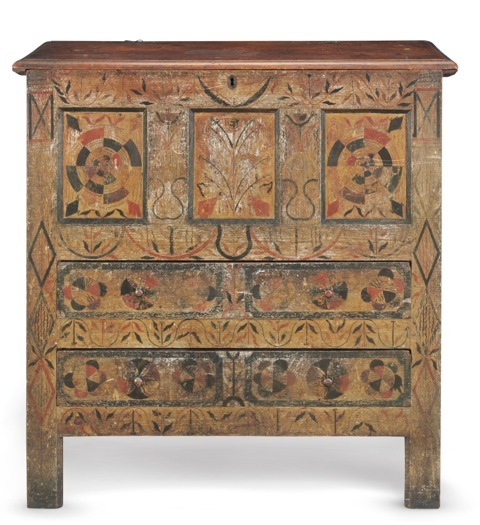 A pristine painted Hadley chest with its original decoration still intact fetched just over $1 million. A unique early dressing table brought $665,000, and a classic Philadelphia Chippendale card table with a distinguished provenance achieved $509,000. These high prices garner headlines and prove that the best of the best still generate significant sums. However, these figures mask the fact that the market for early American furniture as a whole has declined dramatically. At many local auctions, chests that brought $5,000 twenty years ago may sell for only $2,000 today. Certain forms, such as sideboards, have fallen out of favor and often go begging. In many instances, the larger the form, the harder it is to sell. In addition, condition has become a huge factor in the marketplace. Replaced feet on a chest or a desk can easily reduce the value of the object by 50 to 80 percent. What caused antique furniture to drop in value? The reasons are varied and numerous. In the 1950s, 60s, and 70s, appreciation for antiques was widespread in the U.S. Today tastes have changed; lifestyles have shifted; and interior decoration has moved in different directions. At Winterthur on March 13, I’ll explore the current market for American antique furniture and discuss the factors that have affected its value. And while I can’t gaze into a crystal ball and speak with certainty about the future value of “brown wood,” I’ll offer a few thoughts about what might happen in the years ahead. Most importantly, it is not a time for pessimism. Rather it’s a wonderful time to buy—but with a caveat. Buy because you like what you’re buying and want to live with it, not because you see it as an investment. I hope to see you at Winterthur at 1:00 pm on March 13. This entry was posted in antiques, art collections, Decorative Arts, Delaware Antiques Show, Events, Furniture, museum collection, Programs, Uncategorized and tagged 19th century, antiques, collecting, furniture, Winterthur Museum Garden & Library. Bookmark the permalink. Fascinating comments from a very well informed source. As a maker of 18th century Chester County furniture, I have seem most of this, as a part of my experience, in the buying habits of high-end reproductions as well. The big stuff is just not selling well. However, due to the current cost of really great wood, that is not a huge problem for the maker. The smaller, diminutive pieces are popular and one can still make a living from informed buyers who understand and appreciate quality. It’s true that young people seem to have far less historical curiosity, knowledge, or appreciation than what I remember as a youngster. Perhaps that’s another casualty of the internet/smart phone/pop culture that so many live in. Kinda sad. PS- I grew up on a farm in Malvern. Did an apprentice with E. Townsend Moore of Darling, PA, outside of Media, PA. He had some curatorial associations with Wintertur back in the 50’s – 60’s I believe. I am now in Forest, VA, outside Lynchburg. I have always been fascinated with the appeal for antiques. I really think that chest is beautiful, but 1 million dollars is a lot. If you love to collect then I guess price isn’t an issue.